This morning as part of their Computex keynote, NVIDIA CEO announced a new initiative for high-end gaming laptop design. 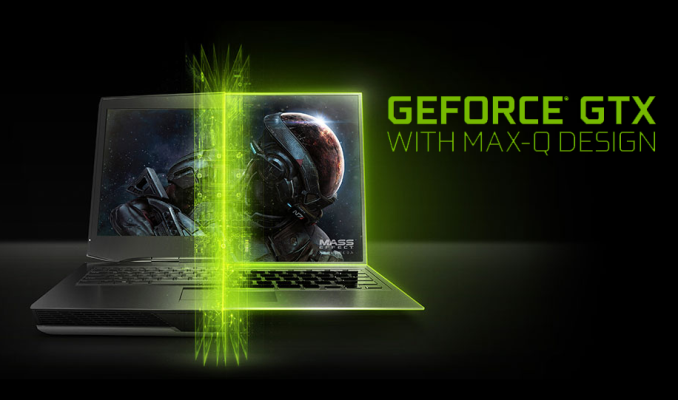 Called GeForce GTX Max-Q, NVIDIA is undertaking their own Ultrabook project of sorts, encouraging partners to develop thinner and lighter high performance gaming laptops, giving them better tools to do so, and then bundling it under a catchy name. The end result is that, not unlike Intel’s efforts in this space, NVIDIA wants to sell consumers on the idea that they can have their cake and eat it too with a light laptop that is still substantially more powerful than their old laptop. As a bit of historical context to this, last year NVIDIA shook up their high-end laptop branding a bit by doing away with “Mobile” video card designations. Rather than having a GeForce GTX 1080M for example, the company simply offered a laptop version of the desktop GTX 1080. Or rather, that was the basic idea behind the policy. In practice these mobile-but-not SKUs had their own specs (e.g. a GTX 1070 with an additional SM enabled), not to mention the greater thermal constraints of a laptop, and of course the use of laptop-appropriate MXM boards. Consequently from a product designation standpoint, this is a bit of a return to form for NVIDIA. They never stopped making mobile parts – and I haven’t seen any evidence that partners couldn’t try for a thin laptop before now – but now at least some of their mobile parts have a mobile designation, just that the ‘M’ stands for Max-Q instead of Mobile. 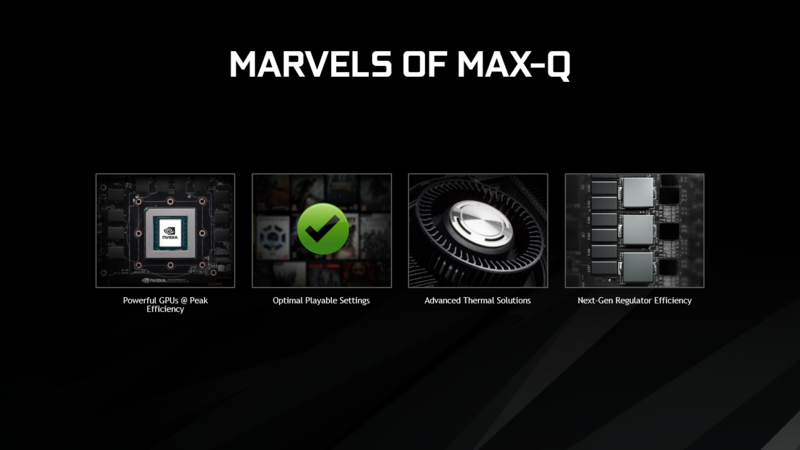 Which admittedly may be a bit of a cynical read on the situation, but as there’s only a very limited amount of new tech involved – and no new GPUs – Max-Q seems to be more about branding and setting performance expectations for high efficiency (as opposed to high performance) parts. On which note, this isn’t the first place we’ve seen the name Max-Q show up, either. So I wouldn’t be too surprised if we see NVIDIA use it in more places. In any case, as part of the Max-Q initiative, NVIDIA is releasing Max-Q designs for the GTX 1080, GTX 1070, and the GTX 1060. Not explicitly stated by NVIDIA, but something I suspect, is that these designs are using new MXM cards and aren’t just a different clockspeed profile for the original cards. But at any rate, these are still the same SM and memory configurations as the original mobile parts, but now with lower TDPs and lower clockspeeds to match. In a specification document NVIDIA released to the press, they listed both the normal and Max-Q TDPs and clockspeeds of their mobile products. I do feel this is a bit disingenuous, as mobile parts are commonly subject to thermal throttling – and few laptops could sustain the 115W+ TDPs of the original GTX 1070 and GTX 1080 – so comparing Max-Q to the desktop-like TDPs of the original parts doesn’t tell the whole story. But in any case, the point NVIDIA was looking to drive how is that while official clockspeeds have dropped by a few hundred MHz compared to the original parts (a not insignificant drop), TDPs have dropped by even more. A GTX 1080 Max-Q that tops out at 110W may only have a boost clock of 1468MHz (a drop of about 15%), but the TDP has dropped by 40W. 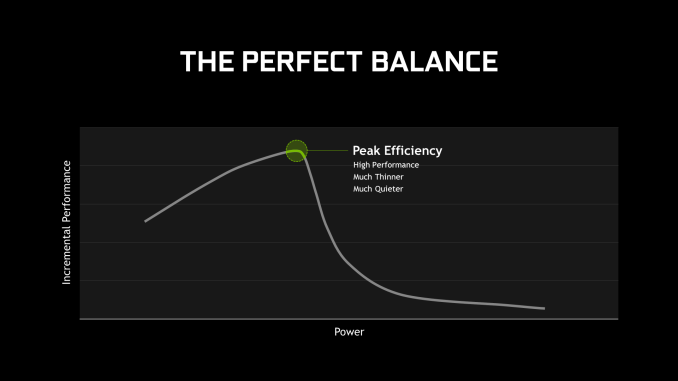 Which ultimately is the principle purpose of the Max-Q branding from the NVIDIA side of matters: these are slower parts at the more energy-optimal point in the curve, instead of going further up the curve in the name of performance. Clockspeeds aside, there are some hardware changes to mention. In discussing the Max-Q design, NVIDIA noted that they have implemented some changes over the years to reach this point. A big part of this is of course Pascal, which gives them a solid starting point for high efficiency performance. But the company has also cited improvements in voltage regulators as part of the Max-Q formula, apparently using very low loss regulators optimized for around 1 Volt(a). And this is where things get a bit fuzzy, since NVIDIA was similarly promoting power delivery improvements for their desktop GTX 1080 reference boards last year; so I’m not sure if there’s anything new here specifically for Max-Q, or if it’s just about how NVIDIA has put the pieces together for boards going into Max-Q laptops. The final piece of the puzzle then is what NVIDIA is calling “advanced thermal solutions”, which the company doesn’t go into much detail on, but notes that it’s responsible for allowing their partners to cool such powerful cards effectively, and to do so without blowing out any eardrums while blowing out hot air. there’s an implication that NVIDIA and their partners weren’t already using high efficiency regulators and good coolers on past products, which of course isn’t the case. The company has been making high-efficiency laptop GPUs for the 100W mark for a while now, and these designs have been powerful in their own right thanks to a combination of solid design and chip binning. So there’s a very fuzzy line here in terms of what’s actually new in terms of video card design, and how much of this is NVIDIA talking up what’s essentially the successor to the GTX 980M (i.e. low voltage parts). This description sounds almost identical to AMD’s Radeon Chill, in which case we should have a good idea of what to expect: framerate throttling combined with GeForce Experience/Battery Boost settings adjustment to turn down the image quality, lowering the overall rendering needs. What isn’t clear is whether NVIDIA is also duplicating AMD’s efforts to time frame rendering such that frames are submitted as late as possible to minimize input lag. 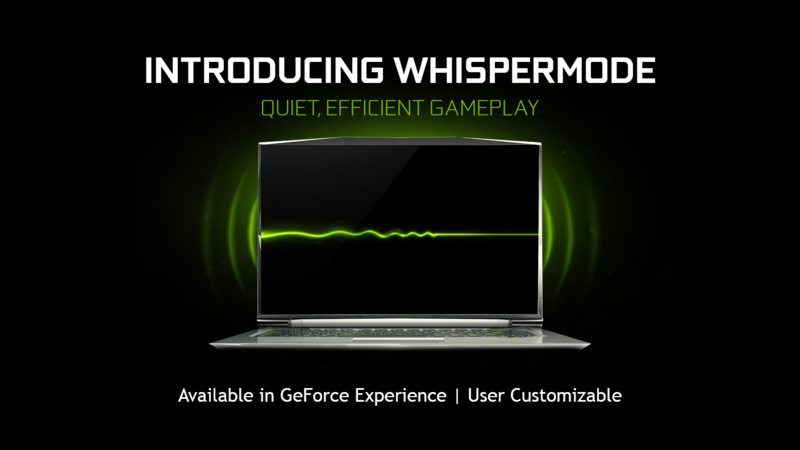 In any case, while WhisperMode is being announced as part of Max-Q, it’s actually part of GeForce Experience. 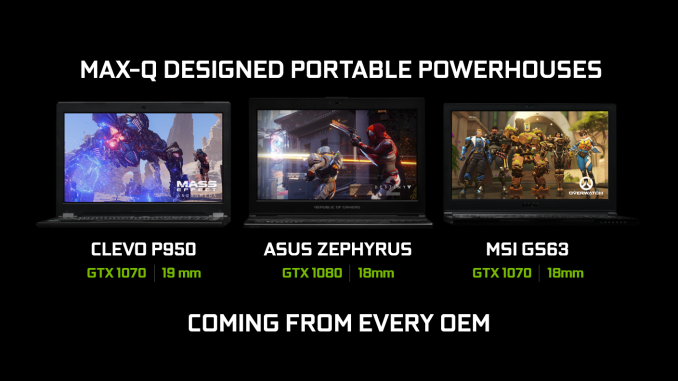 So once released, it will be available to all Pascal laptops – including existing laptops – and not just Max-Q laptops. Last, but certainly not least of course is the end product of all of this: the Max-Q laptops. The goal of NVIDIA’s initiative is to get their partners out promoting thin laptops with high performance GeForce video cards, and their partners have quickly jumped into action. NVIDIA has not publicly announced a definition for what a Max-Q laptop should be, but there is a very common thread among all of the laptops they’ve detailed so far: under 5lbs and under 20mm thick. 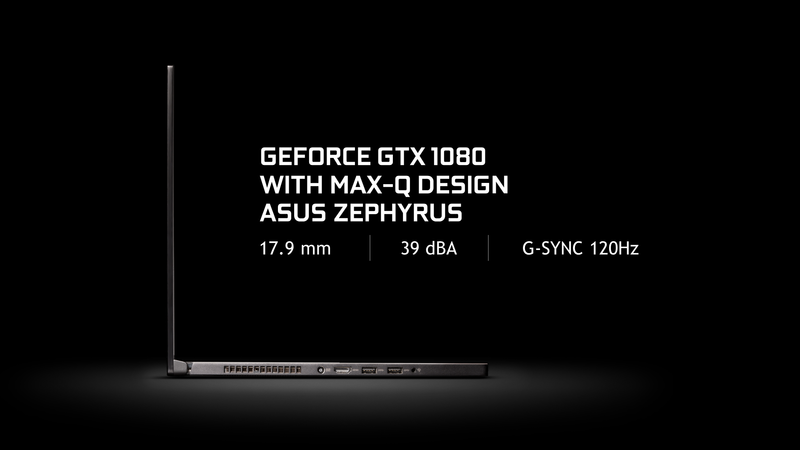 The marquee laptop for the program appears to be Asus’s new UX501 “Zephyrus” laptop, which NVIDIA showed off at their press conference. This is a 15.6” laptop with an Intel Core i7 quad and NVIDIA’s GeForce GTX 1080. NVIDIA has also named laptops from Clevo and MSI, which come with the GTX 1070 and have a similar build. In which case at least among the laptops NVIDIA has shown off so far, 15-inches seems like the sweet spot for this program. NVIDIA is promoting these laptops as having significantly better performance than existing thin laptops – in this case comparing it to an 18mm thick GTX 1060 laptop – though this seems to be more about the GPU used than the thickness of the laptop. The big question of course is just what performance such a thin laptop can sustain; even at the lower-bounds of the GTX 1080 Max-Q configuration, that’s still 90W for the GPU, along with another 35W for an Intel quad-core CPU in a cTDP down state. To NVIDIA’s credit, they definitely know a thing or two about cooling (see: reference blower), so applying that knowledge to laptops could be a boon. But sub-20mm still leaves limited room for heatsinks and fans. Anyhow, expect to see Max-Q design laptops show up later next month, on June 27th. Along with the partner designs NVIDIA is explicitly showing off at Computex this week, they have lined up many of the major OEMs for this initiative. And particularly with Clevo participating, this means their reference designs will be able to filter down to a number of smaller vendors who sell Clevo’s designs.